Quick command allows the user to interact with the device by handwritten input and also open applications, execute predefined tasks and searh for any keywords. How to Call a Quick Command function? 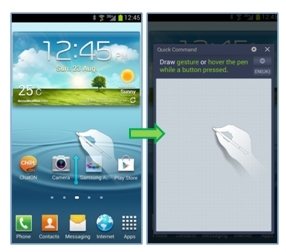 To call quick command, drag the pen from the bottom to top while pressing the pen button. To make a command, either write a gesture command only or gesture command and keywords for more specific tasks. Galaxy Note2: How to increase the Call Volume? Galaxy S3: How can I save a Draft Message in Messaging app?